You are here: Home / Nutrition / Drink. Up. I’m doing it again. Hustling people to drink more water. But seriously though, are you drinking enough? So, how much should you drink? General advice sits around 2L of fluid (ideally, water) over the course of a day. You can be more precise by using the following equation: 30ml of water X your weight (in Kg) = how many litres you should drink per day. For example… I’m 58kg, so I should be drinking at least 1.75L of water each day (0.03 x 58 = 1.74). However, this is a general rule, and the amount you need may vary depending on a number of factors. For example, you will need to drink more water if weather is warm and humid, you’re breastfeeding, you’ve been exercising heavily, or you’ve been consuming alcohol or other dehydrating beverages. 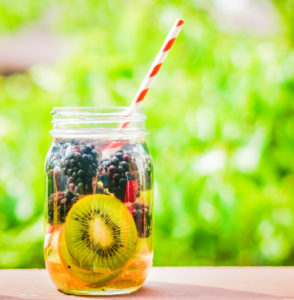 If you find it difficult to drink plain water, you can improve the ‘flavour’ by adding a squeeze of lemon, a wedge of lime, or a small handful of frozen berries to your glass. Alternatively, herbal teas and diluted freshly squeezed juices can be a good way to increase your fluid intake – and in many cases provide a therapeutic benefit as well! Some of my favourites include peppermint, lemon balm, rooibos and cinnamon, chamomile, lemongrass and passionflower. If you are not in the habit of drinking enough and you often forget to sip water, carry a water bottle with you (a reusable one such as Sigg, Kleen Kanteen or Camelbak) so that you have a drink on hand at all times. At work or on your desk at home, sit a large glass and a bottle or jug, again so that you have water in front of you all the time. Foods will also contribute to your hydration – particularly soups and stews, smoothies, fresh fruits and salads full of leafy greens. So, my friends, drink up. Particularly as we’re coming into the warmer weather. Bottoms up!